I’m appalled that anyone would assume that my “womanly problems” would eliminate all of my reasoning. The article basically tells us that if a woman is single, she will vote for Obama and if she is in a relationship, well, her vote will go to Romney. Susan Carroll, professor of gender studies and political science at Rutgers University responds to this best: “A better explanation for the divide in voting preferences between single and married women is the difference in economic status.” Yes! Thank you Susan Carroll! So why doesn’t CNN delve into MEN’S hormonal changes and how that affects voting? Hormones are not sacred to women. Why does CNN present all of this research, as if they want to perpetuate the stereotype that women are too hormonal to be involved with politics? I remember someone saying to me, several years ago, how it would be hell if Hilary Clinton were elected president because she’d be a terror when on her period. All I really learned from this article is that CNN thinks Romney and Obama are “handsome” and since they are “handsome” and women who are menstruating are more attracted to “manly men” and thus can sway their votes either way. We gain nothing from it other than a reinforcement of a stereotype. UPDATE 10/25/2012: CNN removed its article, saying it wasn’t up to “editorial standards.” Glad they woke up. This entry was posted in Uncategorized and tagged hormones, presidential election, women. 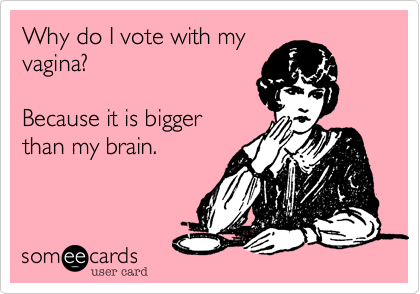 hmm… my hormones are telling me to vote Romney today… now i better hope my hormones will tell me to vote obama when nov. 6 comes around! These damned hormones are just so commanding! They’re taking over everything! That study/article was awful. Thanks for blogging about it.